PLEASE NOTE: This is a theoretical case study representing a guide in how to use CIP in analysing historical and future rainfall patterns in the Swartland region in South Africa. 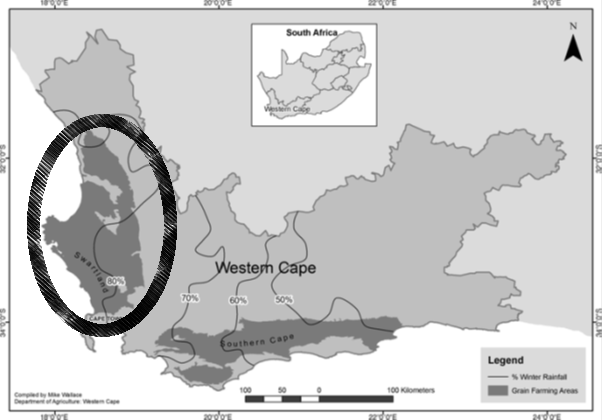 The Swartland region is the area between the west coast and the northern extent of the Cape Fold Mountains in the South Western Cape (see circle on the map, Figure 1). Figure 1: Overview map (Source: Compiled by Mike Wallace, Department of Agriculture, Western Cape). The Swartland region is one of the most important wheat-producing areas in the country. Wheat production in the Western Cape is heavily dependent on winter rainfall as the majority of farmers do not irrigate their wheat crop. Irregular deviations in the winter rainfall can, therefore, greatly affect the yields and quality of wheat production, making the crop vulnerable to dry years. The planting period for winter wheat in the South Western Cape ranges from late April to early June, whilst the wheat is harvested from late October to early December. Farmers require regular rainfall events after planting, from May to September. Typically a minimum of 50 mm of rainfall is required at the beginning of the planting season followed by approximately 10-15 mm every two weeks until the end of August. During September when the wheat grain fills, rainfall of at least 10mm per week is required. Following this, wheat is left in the fields to dry out before harvesting, thereby requiring conditions of low rainfall and warmer temperatures. Farmers have many factors influencing their decisions, from choosing which cultivar to use to international market prices. These influences, coupled with a changing climate, make it increasingly difficult for farmers to make good economical and sustainable decisions. It is therefore of ever increasing importance to provide skillful and reliable climate information to help farmers. Consider a scenario where information on the potential impacts of climate change on agriculture (in particular wheat farming) are required for the Swartland region. How might we use climate information to assess this? 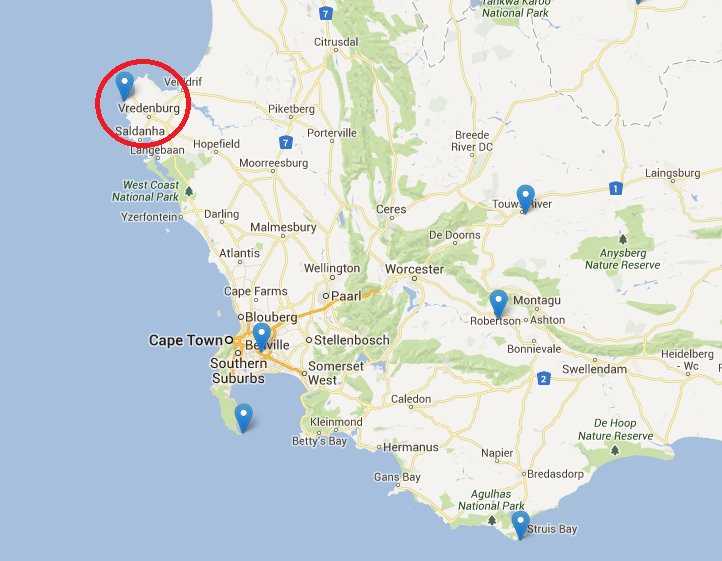 Within CIP we find that there are 2 stations within this region, namely Cape Columbine and Vredendal. For simplicity, in this case study we will concentrate our efforts on the Cape Columbine station data (see red circle on the map, Figure 2). Figure 2: Observing station locations with selected station highlighted. Let’s explore the historical climate records available at the Cape Columbine node. This is useful for identifying particular climate events such as floods and droughts as well as observing long term variability or trends. The historical climate records display the monthly records for the observed period in a plot (Figure 3). In this case the records extend from 1940 to 2000. In the below plot we have selected 'total monthly rainfall' from the drop down list on the top left corner of the plot (see black arrow, Figure 3). Due to the long length of the historical record, the initial plot is automatically adjusted to display annual averages; if there is more than 30 years shown, CIP automatically shows annual averages but if there is less than 30 years shown, it will show the individual monthly values. The Cape Columbine region receives on average 18 mm/month (see grey line, Figure 3), with some years receiving less and others receiving more, hence the area is characterized by interannual variability. By moving the timeline cursor on the bottom of the plot (see red circle, Figure 4), we are able to adjust the years displayed within the plot. Here we have decided to present the most recent part of the data from 1980-2001. Unlike in figure 3, which shows 61 years of data, when we select a shorter period, CIP automatically adjusts the zoom so we now have monthly totals. 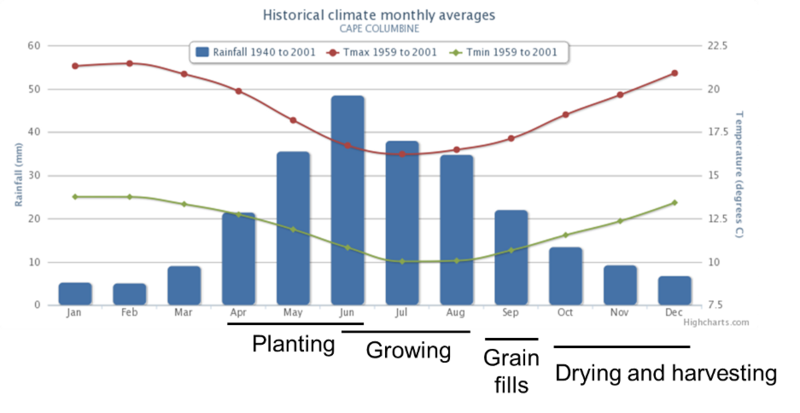 Figure 4 therefore shows the variability in monthly rainfall over the twenty-one year period. Placing your mouse cursor over a particular bar will tell you the period and observed value the bar is representing (see left black arrow, Figure 4). Let’s now explore the historical average seasonality (Figure 5); in other words, how the rainfall varies on average within a single year. The plot below shows the long term monthly climatology of rainfall totals (61 year period, 1940-2001) and monthly averaged minimum and maximum temperatures (42 year period, 1959-2001). This provides a useful overview over the annual seasonality for a location illustrating the typically warm and cool periods as well as wet and dry periods. These monthly climatology values are calculated from the available historical monthly record data. The Swartland region experiences winter rainfall with marked increases in rainfall beginning in April and May, coinciding with the planting season for wheat (Figure 5). Rainfall peaks in June-August when farmers need the rainfall for wheat growth. This is also the period within the year when temperatures are at their lowest. Following this, the rainfall decreases into the Summer months (November-March), characteristically hot and dry, optimal for drying and harvesting of wheat. Figure 5: Historical average seasonality of rainfall, minimum and maximum temperatures for the selected observing station. Overlayed are the important growing season periods for wheat. From here we can further explore the historical trends in rainfall for key months within the year. As mentioned, the planting period for winter wheat in the South Western Cape ranges from late April to early June with the growing season spanning over approximately 120 days from May-September. These are the months in which rain is needed to feed the crop, encouraging germination, growth and grain filling. By double clicking on a particular month (e.g. June) we can explore the interannual variability in rainfall for that month. We have done this for June and shown the resulting plot in figure 6 which shows average total monthly rainfall for June over the period 1960-2000 is 40-45 mm. Information about interannual variability for key months is important for wheat farmers as a dry month (e.g., June 1973 and 1978) can cause crop failure with large financial costs for farmers (see red circles, Figure 6). In June 1994, rainfall was unusually high with the totally rainfall reaching 178mm (see black arrow, Figure 6). This creates questions around the reason behind this extremely high rainfall and the importance of understanding the distribution of this rain within the particular month (i.e., did the rainfall within a 1-2 day period or was the rainfall dispersed evenly over the month). Figure 7 below shows the range of projected future changes (in total monthly rainfall for the RCP 8.5 pathway) across 10 different statistically downscaled CMIP5 GCMs for the Cape Columbine area for the period 2015-2035. In CIP it is possible to select different periods for the anomalies (i.e. changes) shown but we have chosen 2015-2035 because for wheat farming this period sits within the strategic planning timeframe for informing farmers of relative near term changes. Figure 7 shows, in grey, the observed average monthly rainfall totals at Cape Columbine for the period 1940 to 1961. This is exactly the same rainfall information as shown in figure 5 but is especially useful here as it contextualizes the future climate projections. The figure also shows model projections of future climate change (superimposed lines and blue/red bars) but this information is slightly more complicated to interpret so let’s spend a short time explaining what this additional information shows. Output from individual simulations of 10 different Global Climate Models (GCMs) using one specific emissions scenario (link to details on emissions scenarios) has been statistically downscaled to the Cape Columbine station location, using a methodology developed by scientists at CSAG (for more details see…). The 10 “spaghetti” style lines correspond to the 10 individual simulations of future climate at the station. However, the values plotted are not absolute rainfall totals but rather “anomalies” (or changes) in the model simulations from the average monthly rainfall in a historical period (1980 to 2000) to the selected future period (2015 to 2035). For example, in June (see black arrow, Figure 7) the lowest value (-20mm) shows the change between the historical period and the future period of the model simulation, corresponding to an average drying. An arbitrary period of twenty years has been chosen to account for interannual variability but variability on multidecadal timescales is not addressed and can still influence any apparent climate “change” signal. The red bars show the difference between the zero change level and the 10th percentile values while the blue bars show the difference between the zero change level and the 90th percentile. When there are is no blue bar (e.g. Feb) or no red bar (e.g. July) then at least 9 out of the 10 models agree on the sign of the change (e.g. drying in Feb and wetting in July). Remember, in order to compare this output to the observations we need bear in mind that these are model to model anomalies; there is no information provided about the reliability of each model used and whether they accurately represent the observed climate at the station. Now we are in a better position to interpret the future climate projections…. In the plot below we can see that while the projected changes are generally quite small relative to observed climatological means, in June most models are showing a reduction in rainfall, with one model showing a 20mm decrease (see black arrow, Figure 7). However, nearly all of the models are indicating an increase in rainfall for the month of July. This could possibly suggest a shift in the peak of the rainy season to later in the season (drying in June and wetting in July). As this is an important period for the winter wheat crop this could highlight a risk which might impact the winter wheat production in the region. Such information could be of value for famers making strategic plans for the next 20 years. However, in general there appears to be no emphatic signal of a systematic drying or wetting in the region, at least for monthly average rainfall. Responding to interannual variability is therefore likely to remain a priority for farmers in the region. By analyzing the changes in the extreme rainfall (e.g. days exceeding 20mm) we may obtain additional messages relevant to the wheat farmers. Figure 7: The range of projected future changes for Cape Columbine across 10 different statistically downscaled CMIP5 GCMs for RCP 8.5 pathway. Some projections show a decrease in rainfall over the months of May and June and a possible shift in the peak of the rainy season which farmers may need to adapt to in order to maintain economic sustainability. A decrease in the amount of rainfall during May and June could prove problematic with regards to the germination of the wheat crop. Farmers may be able to adapt to such a problem by implementing farming methods which retain soil moisture. An example of such a method is no-till, whereby farmers only disrupt the soil when planting, as tillage allows the soil moisture to escape more easily into the atmosphere. This method is already widely used in the Swartland region especially in the drier northern extents. Various conservation tillage methods leave crop residuals on the field to protect the soil from erosion and to improve soil moisture. However, this is not entirely suitable in the Swartland as there is no crop growing during summer and farmers often farm sheep to reduce their risk of wheat farming and so the residual crop is often used to feed the sheep during the dry season. Wheat farmers in the Swartland apply crop rotational methods, rotating wheat with other crops (such as medics, canola lucerne, etc.) to ensure soil fertility which increases crop yields. Farmers may also be able to change the wheat cultivar used (depending on cost and markets) or the timing of when planting occurs. Though irrigation may seem like an obvious solution, in this region there is lack of easily available/accessible water sources and without dramatic changes in technology and/or economic drivers, implementing irrigation seems infeasible. With a future of possible decreases in early season rainfall, farmers may also try to reduce the risks of relying solely on wheat farming by diversifying farming practices. Using climate information to support adaptation planning and policy-making: A practical case study in Bagamoyo District, coastal Tanzania. Thumbnail image by Robert Wallace.